Many different methods have been developed to monitor microplastics, although the lack of standardisation limits comparability. It is vital to carry out standardised monitoring to acquire a baseline understanding of microplastic contamination in the Norwegian environment. A new project aimed to identify suitable methods for monitoring microplastics in blue mussels and sediments - with sampling stations around the coast of Norway. Blue mussels were efficiently analysed for microplastics presence using the alkali digestive protocol, visual identification and chemical verification using Fourier transform infrared spectroscopy (µFT-IR). As expected, sediment samples were more complex to process for microplastic analysis. Due to the varying degrees of organic content and fine grain size, only semi-quantitative data could be obtained. Presence and absence data along with form of suspected plastics was acquired but chemical verification was not completed. 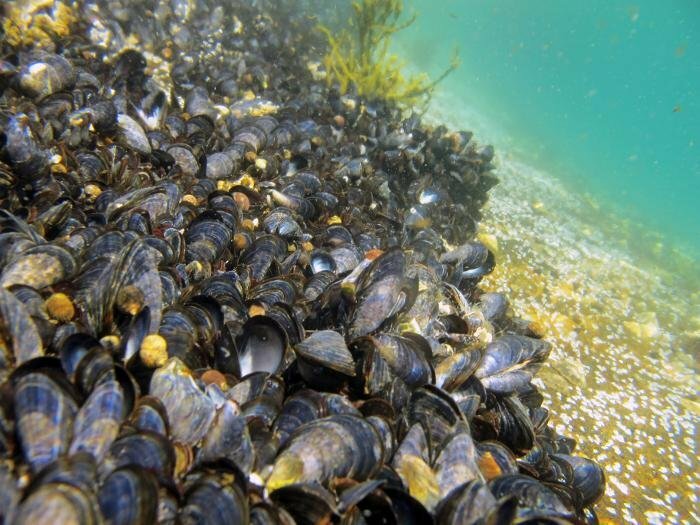 Plastics were found in 76.6 % of individual blue mussels (Mytilus spp. ), with at least one individual containing microplastics from all 13 sites. The overall average plastic load was 1.84 particles individual1 (range 0 – 14.67) or 1.85 particles g -1 w.w. (range 0 – 24.45). Particles from blue mussels consisted of fibres (85 %), fragments (11 %) and films and foams (4 %). Most of the particles were blue in colour (39 %) and the most common polymers were semi-synthetic fibres composed of chemically altered cellulose. The concentrations of plastics per gram were generally low close to urban areas whereas the highest average concentration was seen in a rural site in Finnmark. It is however important to note that it is unclear whether this is a true representation of the quantitative plastic pollution between sites, since the results might have been affected by other environmental and methodological factors, such as the larger sized mussels collected from urban sites. Plastic fragments and fibres were identified in replicate sediment samples using both methods (sieving and density separation). The identification of beads in sediment samples however, requires chemical classification before they can be accepted due to similarities with foraminifera and colour change caused by NaI flotation. This is the first time that microplastics have been identified in the Norwegian environment through a large scale, co-ordinated survey. Differences in levels of microplastics identified in mussels from sites around the Norwegian coast may be caused by several factorssuch as hydrographical and atmospheric conditions, including tidal flow and amplitude, ocean currents, freshwater flow, locality to anthropogenic inputs and atmospheric deposition. Other procedural steps may also have an impact on the results seen here such as mussel size and the overall analysis conducted. of microplastics (R & D-project). NIVA-report 7209-2017.